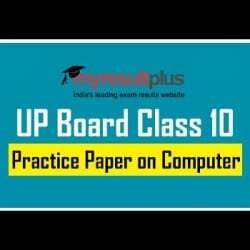 UP Board Class 10th Computer: Model papers are being provided here for a thorough revision. The computer is one of the most important subjects for class 10th students of UP. Therefore, students should prepare this for sure. The sample paper is given here along with the tips which are very useful for students of the UP Board of Examination, Class 10th. The sample paper is especially being prepared for the students by the experts. Practising these questions will hopefully give a positive result. Ques1. What are the numbers of a binary system called? Ques2. Which of the following example is not software? Ques3. Who composed the 'C' language structure & when? Ques4. What do you understand by 'GUI'? Ques5. What do you understand by Demodulation? Ques6. What do you understand from the word 'searching'? Ques7. Draw a diagram of the primary communication model and mention its main components. Ques8. How Linux differs from Windows? Explain. Ques9. Define Operating System. Give some examples of Operating System with an explanation. Ques10. Comment briefly on Optical Fiber.